We don’t spend a lot of time talking about entry level four-doors, and with good reason. These cars serve a noble purpose, hauling people from point A to B, but other than that they don’t generate much buzz. That’s what makes the 10th-generation Honda Civic so intriguing. Despite being “just a Civic” the car is a magnet for the spotlight. It was named the 2016 North American Car of the Year (NACOTY), beating out the always awesome and new Mazda MX-5; the Chevy Malibu was the other finalist. The fact that an economy car could beat out a sporty roadster for such an award intrigued me and was part of the reason why I was so keen to jump behind the wheel of the new four-door Civic Touring (provided by Honda) for a week. After a week behind the wheel I realized that Honda captured the NACOTY crown not for making a car that's better than the Miata but for breathing life back into an iconic model that had grown stale and boring over the years. The effects of this turnaround job are most obvious from the outside. 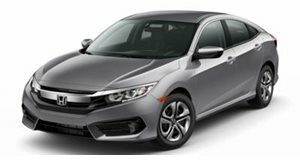 The new Civic ditches the homely looks of its predecessor in favor of an athletic figure reminiscent of a linebacker in a three-point stance. The new design is lower, wider and longer. The wheelbase is 1.2 inches longer and the overall length is up 2.9 inches. It’s also leaner and tighter. Weight is down 68 pounds and torsional rigidity is up 25 percent thanks to the increased use of high-strength steel. Of all the new tidbits I was particularly taken with the LED headlights, taillights and the 17-inch wheels, all three of which are standard on the Touring trim. Touring is the top trim and my tester checked in at $27,355 without options. The 1.5-liter turbo-four makes 174 horsepower and 162 lb-ft of torque, available between 1800 and 5500 RPM. The turbo engine is mated to a CVT. 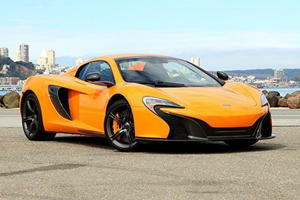 There is a six-speed manual on offer but for the 2016 it's only available on the naturally aspirated 2.0-liter engine. That will change come 2017, though. The turbo is more powerful, though, with the naturally aspirated unit only making 158 horsepower and 138 lb-ft of torque. This is the first turbocharged engine ever offered for the Civic and it’s quite peppy though not a speed demon with a 0-60 mph time listed at 7.0 seconds. There’s turbo lag off the line but power delivery is smooth once the revs build. (Pro tip: Cheap kicks can be had watching the boost build on the gauge cluster.) There’s no manual mode but there is a sport mode that delays upshifting and provides greater engine braking. You can also shift into “L,” designed for hills and mountains where greater braking is needed. And since it’s Honda you also get an “Eco” mode. The MPG split is 31/42/35 and I found those figures to be mostly accurate. I would have preferred to row my own gears or play with paddle shifters but I will say that existence of the CVT in the 1.5-liter turbo isn’t irksome. After a while I didn’t really mind the lack of feedback as the numbers on the speedometer crept ever upward. Four-wheel disc brakes are standard across all trim levels—a Civic first—and provide suitable stopping power but nothing more. There is no double-wishbone suspension system but the MacPherson strut suspension up front and the rear multi-link unit in back come together to provide a solid mix of performance and comfort. The dual-pinion Electric Power Steering system skews a bit towards the enthusiast side of things (just a bit) but still isn’t very lively. One area where the Civic is above average is in cornering, this thanks to brake vectoring, aka Agile Handling Assist. Braking force is applied to the inside wheels during turns to cut understeer. Overall the Civic jumped at the chance to pass other cars on the highway and was more fun in corners than expected. My only real complaint with the car was its interior. I found the grey leather too bland, especially given my tester’s $27,000 price tag. I was also annoyed by the lack of physical controls for the 7-inch touchscreen infotainment system. The steering wheel controls worked but I would have liked knobs to twist when I wanted to rapidly cycle through menus or stations. The design of the center console was also confusing. Why is there a little charging cubby, complete with a USB port and 12V outlet, below the center stack? That leaves devices either out of reach or requires the driver to snake cables around the shifter. But these are minor complaints. Overall the cabin is spacious and well-appointed. The trunk offers 15.1 cubic feet of storage space but it doesn’t really eat into the rear legroom, although rear headroom will be an issue for those over 6’0”. My head hit the roof (I stand 6’1”) in all three rear seats unless I was slouching. My tester also offered heated front and rear seats, along with Apple CarPlay and Android Auto. And as expected the new Civic is safe. It was an IIHS Top Safety Pick+ and it’s easy to see why. The driver and front passenger get side and frontal airbags and the car is equipped with side curtain airbags with rollover sensors. Active safety features include brake assist and vehicle stability assist. My tester was equipped with the Honda Sensing Package, which features Adaptive Cruise Control, Collision Mitigation Braking System (CMBS), Forward Collision Warning, Lane Departure Warning System, Lane Keeping Assist System (LKAS) and Road Departure Mitigation. Most of these features are ubiquitous on new cars, but I did take issue with two of them. I found CMBS to be overprotective and annoying as it would continually flash “BRAKE” across the digital dash whenever I came close to a car. LKAS is essentially a watered-down version of Tesla’s Autopilot and doesn’t work very well even when it does manage to recognize lane lines. Underwhelming cabin design and annoying safety nannies aside I came away impressed with the 2016 Civic Sedan. I haven’t gotten behind the wheel of the new MX-5 but it doesn’t seem like a stretch to say the Mazda is more fun. Still, I can see why the Civic won NACOTY. Honda has taken the Civic back to its roots, creating a car that's fun to drive and easy on the eyes. It's also ridiculously safe, fuel-efficient, practical to a fault and pretty damn cheap with an entry level model (the LX six-speed manual) coming in at $18,640. If all that isn't worthy of an award then what the hell is? Of all the cars we test drove in 2016 these are the six we recommend purchasing. 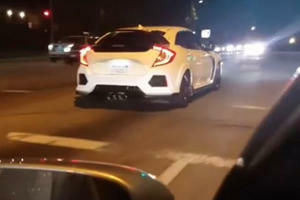 Does This Video Show A Honda Civic Type R Testing In California? It looks a bit too tame if you ask us. 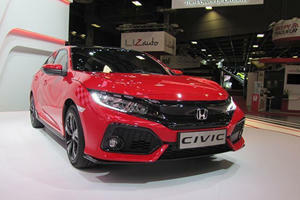 Honda tell us why robots won't take over its cars and what it thinks about a new Civic Hybrid.